With the transfer window slamming shut for another summer, the annual ritual of last minute rumours are in full force. The Sun – not always the most reliable source – are rehashing speculation that Brighton & Hove Albion have not given up on their interest in Lee Wallace. The English Championship club were linked to the Rangers left back a few weeks ago when they supposedly make a bid in the range of £600,000 – £800,000. This talk of clubs putting in bids for Lee Wallace has become customary with each & every transfer season. A new name mentioned in the latest transfer talks is one that Rangers supporters have been dreading ever since he emerged as an 18 year old during the 2012-13 season. Lewis MacLeod was included in The Sun’s report & is a player that wasn’t going to avoid transfer talk for too much longer. The article suggests that Rangers would be willing to part with, arguably its two finest players, for a package deal with a price tag of £3 million. Obviously with the club being strapped for cash, this latest round of rumours is bound to gain some traction. Of course, Rangers have been down this road before & it is difficult to foresee Rangers parting with players of Wallace & MacLeod’s caliber. MacLeod, in particular, would be a devastating loss as the 20-year old has been seen as the cornerstone of Rangers future & one of the few young players to have had the chance to cultivate his talents playing first team football over the past 2+ seasons. However, given that he is often played out of his most natural position you have to wonder if MacLeod would be eager for a change in scenery – if given the chance. It has been surprisingly quiet around Ibrox this transfer season, with very little talk of players being recruited by outside suitors. The talk of St. Johnstone’s interest in a loan for Dean Shiels fizzled when Rangers reportedly were looking to sell the Northern Ireland internationalist rather then loan him out. Sheils only made 17 starts in all competitions last year, scoring eight goals, but is clearly little more then a depth player at this point & is blocking the assertion of younger players into the first team squad. 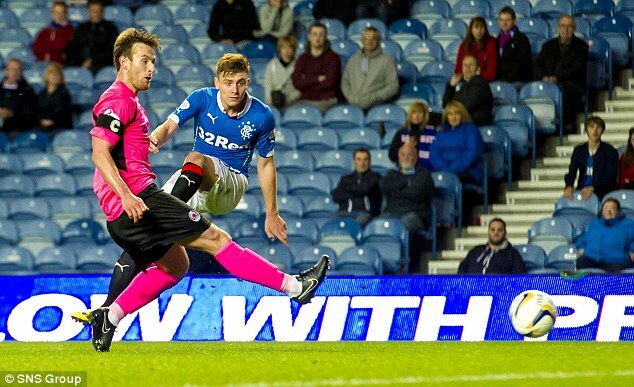 Rangers tried to off load him last January, but clubs shied away from inheriting his salary. Bilel Mohsni & Arnold Peralta are the only other players mentioned in the media as possible departures, but the market is pretty limited for those two. Sources who cover Honduran football recently told Rangers Report that there has been no word of any interest in Peralta’s services. Most observers seem to expect very little movement out of Ibrox – which is slightly troubling given the unnecessary size of the club’s roster & it’s monthly wage bill. The squad is filled with veteran players who see little – to no – playing time, while blocking the progress of younger players. The signings of Steve Simonsen & Lee Robinson are the ultimate example of a management policy that stifles the opportunities for young players. If there were young players in line to replace the likes of Wallace & even MacLeod, this latest gossip would be a little easier to swallow – but frankly all it would do is open the door for retreads like Steven Smith & Dean Shiels – which doesn’t exactly get you excited about the club’s long-term planning. Especially given that any money accrued in transfer fees would simply be used to plug the omnipresent leaking budget. No matter what happens on Monday – it is time for a critical evaluation of Ally McCoist’s management of this squad – especially given the size of the budget he has amassed for the club. Pathetic on and off the park. McCoist and the present board who keep backing our faceless investors have to go. IT’S THAT SIMPLE!!!!! I really hope we keep hold of MacLeod and Wallace. questions must be asked as to why there hasn’t been a clear out of the squad afterall we have many players sitting on a bench every week not good enough to be playing for Rangers.